It was supposed to mark the end of my childhood. Instead, I got thrown right back in the middle of it. I was a kid again – despite having kids of my own now – all because the kid from Kalamazoo did what he always does…one last time. 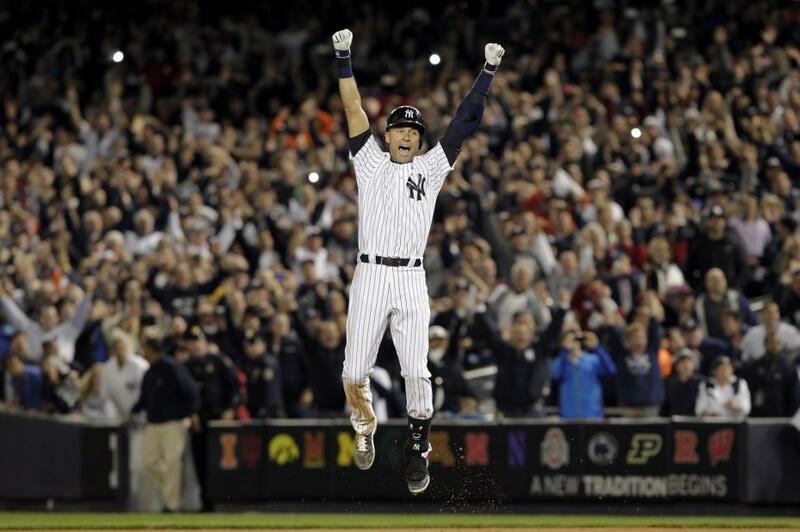 Jeter Leaps Following His Walk-Off Hit. Thursday night against the Orioles, in his final Yankee Stadium at bat, Derek Jeter poked a bottom of the ninth, game winning RBI single to right field. 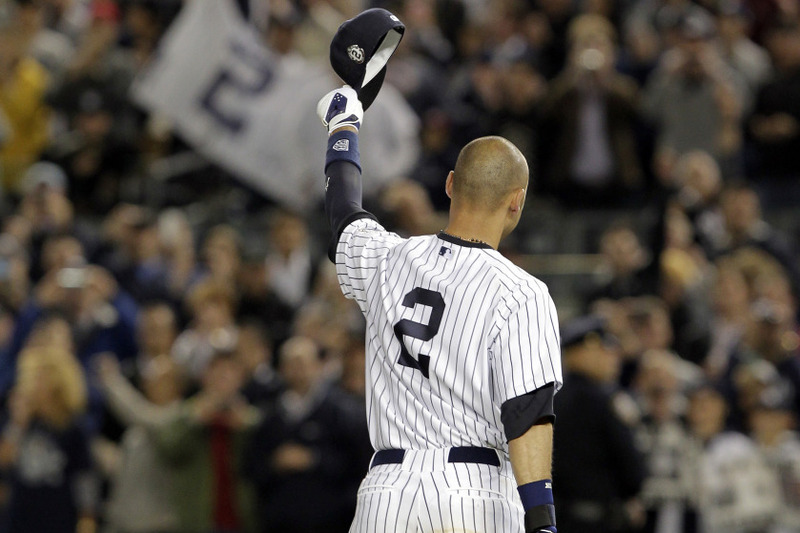 In the last huge moment of his twenty-year career, Jeter came through again. His storied career is loaded with sweet ice cream sundae moments, and this last one will sit near the top like a cherry. Captain Clutch’s latest greatest moment didn’t surprise anyone who’s been paying attention for the past two decades. It certainly didn’t shock me. Instead, it brought me right back to the late-90s, when these types of things happened with regularity. After securing victory, Jeter leapt high into the Bronx night, the way he used to back when I was in high school. In that moment, his recent injury woes and diminished abilities didn’t matter. The forty candles on his last birthday cake didn’t matter either. In that moment, the only thing that mattered was that Derek Jeter – at least for one night – was a kid again, flying high through the sky, arms raised, like the super hero he’s been for more than half my life. He always seems to save the day for the Yankees. As teammates flooded the field, so did memories of previous triumphs, so magical and so perfect, you’d think the whole thing was a Hollywood script. Instead, it’s reality, and Jeter’s been the one writing history, one remarkable moment at a time, for the past twenty seasons. 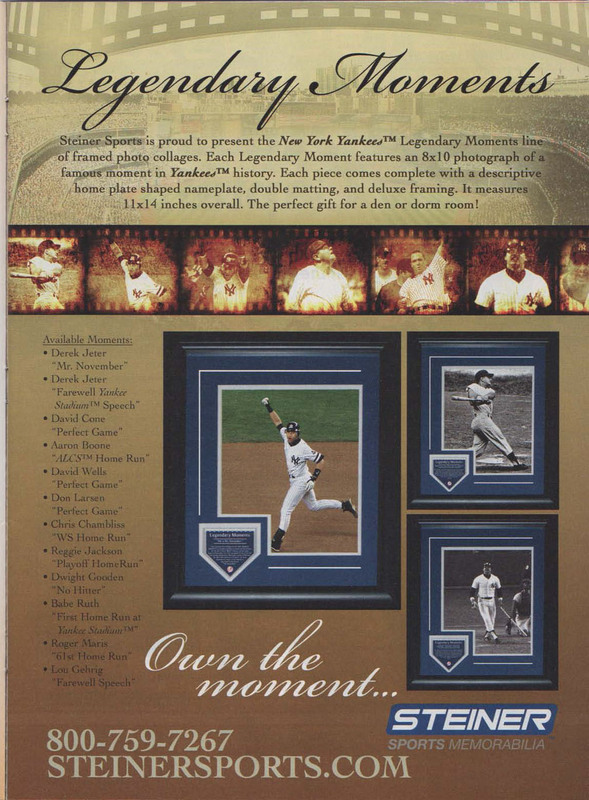 When the spotlight – and camera phone flashes – were brightest, that’s when Jeter would always shine brighter. Thursday night was no exception. His walk-off hit was so reminiscent of past Jeter conquests, you’d swear you saw the Posadas, Pettittes, Bernies, Tinos, Torres and Mos out there celebrating victory with him. And then they actually were. Torre, Posada, Rivera & Martinez Wait To Walk Jeter into Retirement. Jeter’s baseball brothers stood behind home plate in the Bronx, quietly watching their former teammate do what he always seems to do…one last time. Then, they too congratulated him and symbolically asked him to join them in retirement. It was a poignant moment that, no doubt, had Jeter fighting back some tears. Neither were those of us watching the drama unfold. Eliminated from playoff contention the night before, it was the first game of Derek Jeter’s Yankee Stadium career without any meaning. Jeter Acknowledges The Yankee Stadium Crowd. Except, in the end, it really meant so much. For me, it was a chance to be a kid again, one more time, when these types of Jeter moments happened with regularity. Yankees Trio Part Of My Childhood. My Daughter’s Too. That’s what my three year-old daughter calls them. I’m just ecstatic she even knows who they are. Like the iPhone, baseball rosters change every year. Players come and go, switch teams, retire, or fade into baseball ambiguity as their skills diminish. 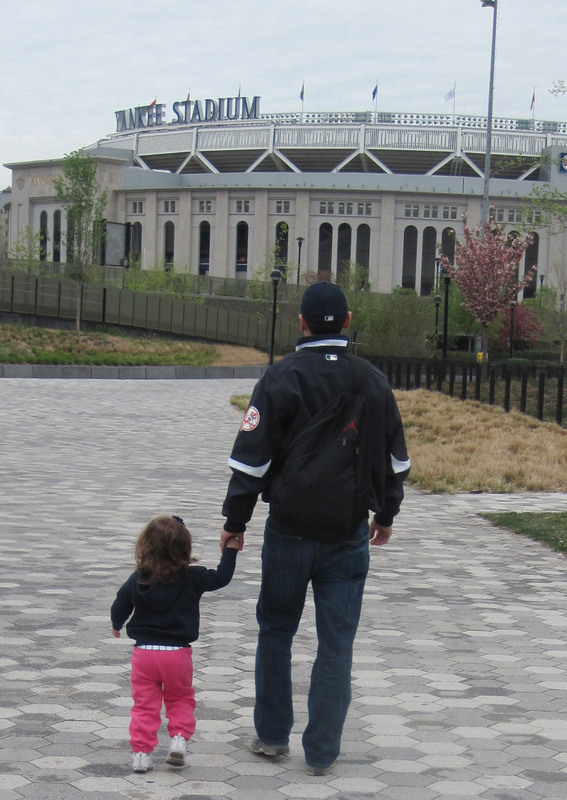 Taking my daughter to a game in April 2013. Yet, incredibly, Derek Jeter, Andy Pettitte and Mariano Rivera have remained a constant within the Yankees Universe for 19 years. Long enough for me to enjoy them with my daughter. It’s every father’s dream to share their passion with their children. Jeter, Pettitte and Rivera were a major part of my childhood. Remarkably, they are now a part of my daughter’s too. I’ve watched them compete since 1995, when I was a fifteen year-old sophomore in high school. I grew up celebrating their success. Some of my happiest memories were made watching the three of them play, and win, in the Bronx. Now I’m 33 years-old, married, and have a child. Think about that. They’re still playing! Not on a YES Network Yankees Classic from ten years ago. They’re still out there grinding today (Jeter’s injuries aside), at a high level for the Yankees, in 2013. It’s a remarkable tribute to their consistency, longevity, and drive to succeed. When the 2013 season ends, so will Pettitte & Rivera’s careers. Jeter isn’t far behind. Together, they’ve authored tons of memorable moments. Baseball fans of all ages are fortunate to have watched their extraordinary careers. When they finally leave the game for good, they’ll take a piece of my childhood with them. If tomorrow’s Opening Day is the beginning of the end for Mariano Rivera, I’m proud to say I faced him at least once during his remarkable career. The first time I saw Rivera throw a baseball, I was fifteen years-old. It was 1995, and I couldn’t drive a car yet. Luckily, to tag along on his impending ride into baseball immortality, I didn’t have to. 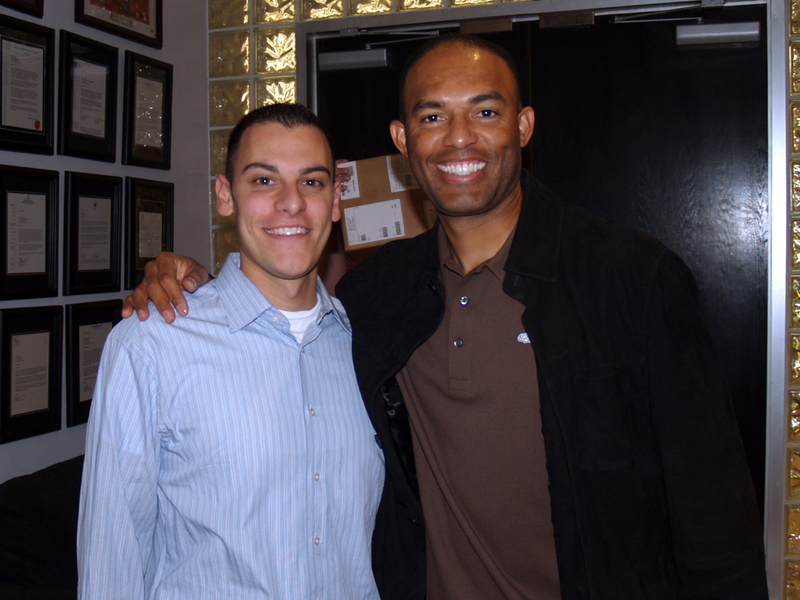 With Mariano Rivera, in 2007, After Our Face Off. For half of my life, I’ve watched the Yankee closer dominate a sport like no other athlete ever has. His tranquil disposition and devastating cutter are both legendary. His career regular season numbers are staggering and his postseason stats are incomprehensible. His competitive spirit and propensity to always do the right thing help make him the most revered player in baseball. In May of 2007, I got a first-hand glimpse of both these remarkable traits when I personally stepped up to the plate against The Great Rivera. While working at Steiner Sports Marketing, I would periodically unite passionate clients with their sports heroes during a public question and answer session or a private meet and greet event. I had arranged to meet Rivera prior to an afternoon game in the Bronx, and introduce him to a client’s child. The brave youngster was battling illness and desperately wanted to meet his favorite player, Mariano. The meeting was scheduled for 10:45 AM behind the Yankees Dugout, just before the gates were scheduled to open to the general public. Rivera was to huddle up with us for about 5-10 minutes, take some pictures, and sign some baseballs. There were very few people in the Stadium at that point so connecting wouldn’t be an issue if things went according to schedule. They didn’t. By 11:00 AM, Rivera had yet to emerge from the clubhouse and other fans were starting to make their way into the building. I reassured the child that everything would work out as planned, but the beads of sweat on my neck told a different story. I was panicking. Was I being stood up by Mariano Rivera? How could this be reconciled? What would I tell the child? How could I explain to my boss, Steiner Sports CEO, Brandon Steiner? It was embarrassing, like a hitter’s feeble attempt to connect with one of Rivera’s cutters. Then, “The Sandman” entered. The greatest closer in the history of baseball popped his head over the top of the dugout looking for me. It was 11:10 AM, the gates were open, and I was now surrounded by autograph-seeking fanatics. I yelled for Rivera. So did the three hundred other people now standing with me. He couldn’t find me in the crowd and disappeared back into the dugout. The meeting never occurred. Despite their distinct disappointment, the child and his family were very appreciative of my efforts. I profusely apologized and left them to enjoy the afternoon from their seats, just behind the dugout. Two days passed and I received a call from Brandon. He summoned me to his office to discuss my botch in the Bronx. When I entered, there was already someone sitting with him – a balding, lanky-looking guy in a brown polo and black jacket. The skinny fellow sitting in the office calmly uncrossed his legs, spun himself around, and flashed a bright toothy smile in my direction. It was Mariano Rivera. I dug in against the legendary pitcher, blaming his tardiness for the plan’s failure. Rivera stared me down and unloaded some high heat in my direction. He contended that he was exactly where he was supposed to be and that I was the one who dropped the ball. Mo shot me a look, and then grinned. He was toying with me, trying to break me like an opponent’s bat. I didn’t stand a chance, did I? 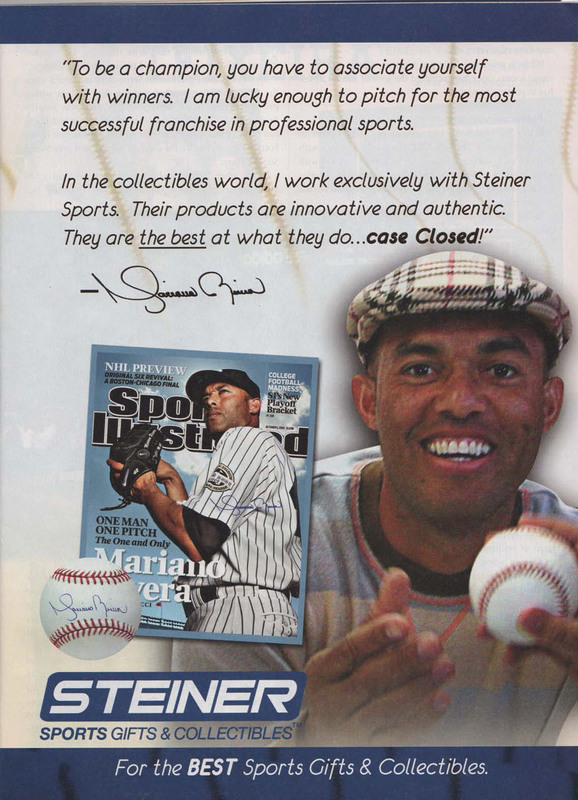 He was Mariano Rivera, after all. I knocked the dirt out of my cleats and stepped back in the box. Again, I detailed exactly what went down, condemning Rivera’s poor punctuality and questioning his recollection of the day’s events. The competitive Rivera calmly and quietly shook his head in disagreement. Brandon, still smiling as he presided over the dispute, seemed to enjoy watching me try to take down the celebrated closer. It was clear, this was going nowhere. Like on the mound, Rivera, the ultimate competitor, could do no wrong. Our showdown yielded a benign base on balls as I walked out of Brandon’s office without resolution. Baffled by Rivera’s stubbornness, I slumped back down at my desk and got back to work. I remember thinking, this must be what it’s like to hit against the tenacious pitcher. He never admitted he was late the first time – he didn’t have to. After all, a good closer is always last to enter a game, but ultimately, seals the deal when the pressure is on. Mo did just that. He met the boy during the next home stand. The get-together was just a brief stop on baseball’s freeway for Rivera, but it was a prime example of how the closer always gets the job done. He’s hinted that 2012 will be his final stop. If he decides to take the exit ramp at season’s end, it will take him directly to Cooperstown. He’s a Hall of Famer both on, and off the field. It’s been a heck of a ride for Mo. I’m glad I got to face him at least once along the way. 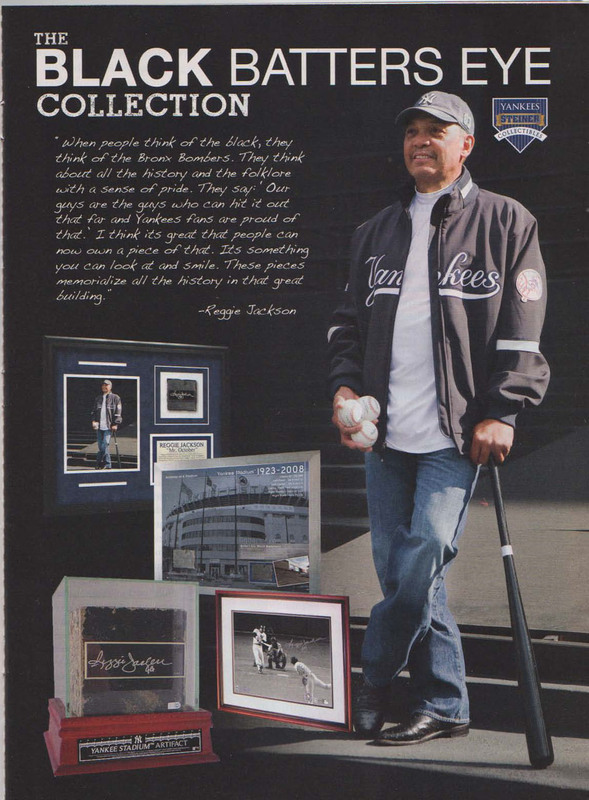 Mariano Rivera is about to catch Trevor Hoffman. When he does, Jorge Posada is the right man to catch Rivera. The immortal Rivera is just one save shy of 600, two away from joining Hoffman atop the all-time career saves list with 601, and three away from passing him with 602. After that, there will no doubt be more saves added to Rivera’s first-ballot Hall of Fame resume – the ageless closer currently has a 2.09 ERA, and at age 41, looks as good as he ever has. Perhaps prospects like Jesus Montero or Austin Romine will backstop Rivera’s final career save, sometime in 2012 or beyond. That’s for another day. When Rivera collects his 602nd career save, probably sometime in the next week or so, it should be Posada receiving the record-breaking, and no doubt devastating, cutter. There is no one more fitting to do the honors. For 13 seasons, from 1998-2010, Posada was a mainstay behind the plate for the Yankees. Although the switch-hitting catcher was always revered more for his abilities at the plate, rather than behind it, he certainly held his own defensively over the years. With the acquisition of Russell Martin, and up-and-comers Montero and Romine on the way, Posada was relegated to DH in 2011, getting the occasional start at first base. He was also embarrassed twice, on national TV. First he was dropped to 9th in the line up on May 14th, and then he lost his DH job on August 7th – both prior to games with the Red Sox. Iroinically, when injuries claimed Martin and back up Francisco Cervelli, Posada was thrown behind the plate for the first time all season on September 10th. However, the Yankees were so disenchanted with the 40-year-old catching, they called up the 22-year-old Romine the next day to take over. Posada has lost a step, and this will most likely be his final season in pinstripes, but he deserves the opportunity to be a part of history with his battery mate, Rivera. On July 9th, Posada was the first one to congratulate his long-time teammate Derek Jeter at home plate following his 3,000th career hit. For 13 seasons, Posada was the first to toast his closer, dropping the ball in his mitt, save after legendary save. He’s certainly capable of catching one more inning – the ninth of course – during the record-breaking affair. It’s the right thing to do for a franchise obsessed with history and magical storylines. There’s no question, the moment will belong to Rivera, but Posada should get to play a small part in the festivities. “Enter Sandman” will fill the air as Rivera makes his iconic trot to the hill, in hot pursuit of history. The flashbulbs will be popping that night. It’s only fair that Posada’s glove is popping too. A pen rests peacefully on the desk, nestled next to a clean, white, crisp piece of paper. Together, they will transcribe history. There are no guidelines or limitations for what’s about to be written. No guarantees either. Only hope. Time to pick up the pen and script a new beginning. 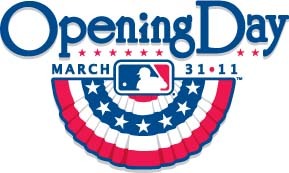 Regarded as a pseudo National holiday, the celebration grants all 30 Major League Baseball Clubs a clean slate, and takes place today, and tomorrow, within stadiums across the country. It’s one of the most anticipated events on the sports calendar. 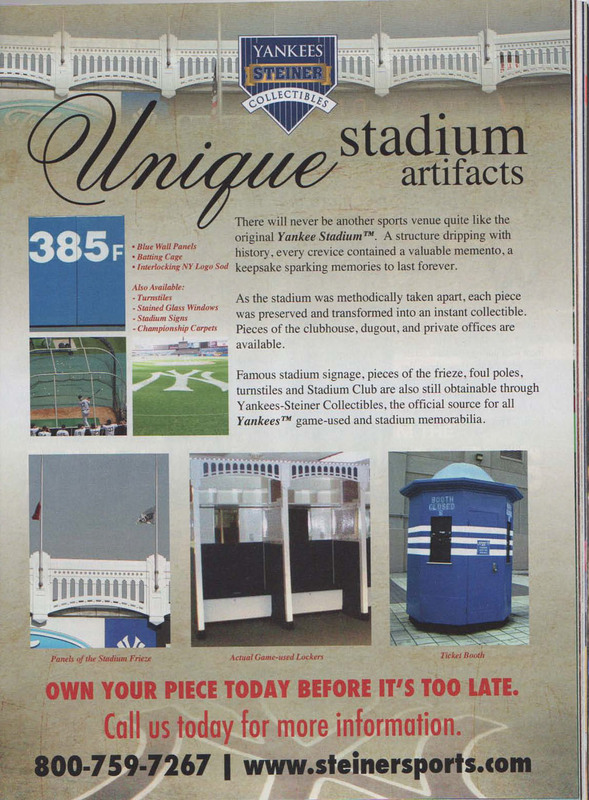 After a miserably long, cold winter here in the New York area, baseball fans are eager to trade in their snow shovels for Louisville Sluggers and get cracking! “Joltin’ Joe” couldn’t have spoken truer words. Everyone’s a kid on Opening Day. Children of all ages play hooky from school, and work, properly commemorating the day and basking in its excitement. It’s an opportunity, as a fan, to believe in the impossible. Today, everyone’s in first place, and everyone has a chance to achieve greatness. In Queens, Opening Day 2011 is truly the dawn of a new era. New Manager, Terry Collins and General Manager, Sandy Alderson, replace Jerry Manuel and Omar Minaya, respectively. New leadership and focus at the top will help a team that looked lost much of 2010. The 2011 Mets are looking to improve on a paltry 79-83 record, good for 4th place in the National League East last year. They will have their hands full in a very difficult division. For the Mets to capture the flag, they will have to go through their long-time rivals, the Atlanta Braves and the Philadelphia Phillies – a team stacked with the most dominant pitching staff in the sport. If the Phillies were playing poker, they’d confidently go “all in” with their four aces, Roy Halladay, Roy Oswalt, Cole Hamels, and the newly re-acquired, Cliff Lee. 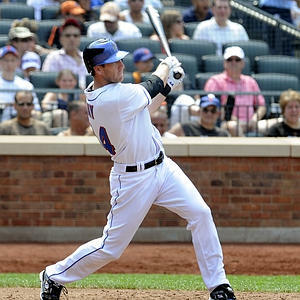 A successful 2011 season for the Mets will depend on their ability to stay healthy. Johan Santana, the jewel of the pitching staff, is already in danger of missing the entire season as he recovers from elbow surgery. Question marks in the outfield could cause problems as well. Carlos Beltran continues to battle the same knee problems that plagued his 2010 and Jason Bay pulled a rib cage muscle this week, an injury that could send him to the Disabled List to start the season. If key members of their offense can spend more time in the lineup than the infirmary, this club could contend. They will have no trouble scoring runs with stars like Jose Reyes and David Wright at the top of their order again this year. Add a healthy Beltran and Bay to the mix, and the Mets could potentially compete. Across the river, in the Bronx, a new season brings the same expectations: an October date with the jeweler. 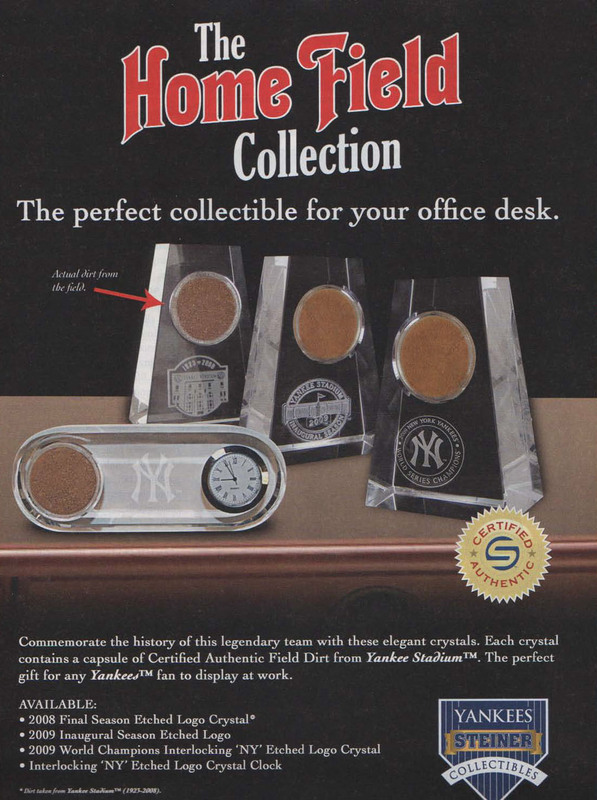 That’s when the Yankees hope to be fitted for World Series rings commemorating another championship, the 28th in franchise history. Like the Mets, the Bronx Bombers will have no trouble scoring runs in 2011. Superstars like Alex Rodriguez, Mark Teixeira and Robinson Cano round out the heart of a devastating lineup and will do most of the damage for the Yankees. Expect a big offensive year from Curtis Granderson as well, as he looks to rebound from a subpar inaugural season in pinstripes. The face of the franchise, Derek Jeter, will also try to improve upon a statistically poor offensive 2010 season. Now 36 years-old, The Captain will look to silence critics by still producing at a superstar level. Jeter will make history this summer, becoming the first Yankee to collect 3,000 hits in pinstripes. He enters the season only 74 hits shy of the mark –he should get there by mid-June. The key to the entire Yankees season is an unlikely one: A.J. Burnett. With Andy Pettitte’s retirement, and Cliff Lee’s decision to take his talents to Philly instead of the Bronx, Burnett’s shoulders might get sore carrying the added expectations. CC Sabathia will be solid at the top of the rotation, as usual, but he’ll need help. Burnett must carry his weight and turn the page on a disastrous 2010 season, recapturing the magic on the mound that helped bring the Yankees a Title in 2009. Should the train go off the track early on, look for General Manager, Brian Cashman, to make some moves and shore up the rotation before the trading deadline. With two stud catching prospects in Jesus Montero and Austin Romine, the Yanks might have the chips to land a top starter via trade. Promoting the young, and highly regarded pitching prospect, Manuel Banuelos, is another option. The acquisition of Rafael Soriano should compliment the legendary, Mariano Rivera, joining forces to form a dominant backend of the bullpen. With those two, the Yankees will certainly have no problem finishing games. Before they can finish though, everyone has to start. It begins this afternoon, in the Bronx, with the Yankees and Tigers. It continues tomorrow night with the Mets and Marlins in Miami. Time to pick up the pen and begin documenting history. It’s a fresh start. It’s Opening Day. Believe it. Pettitte One Of Most Reliable Yankees Pitchers Ever. For sixteen seasons, he dramatically stared down opposing batters and came up big in the biggest of spots. 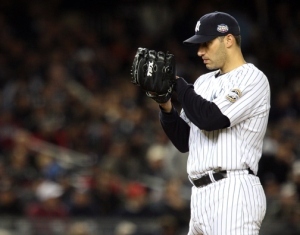 More times than not, Pettitte delivered, earning the trust of his teammates and his fans alike. Tomorrow afternoon, Pettitte will stare down a throng of media at Yankee Stadium to announce his retirement. When he does, trust him when he says, he’s thrown his final pitch in baseball. Pettitte will not pull a “Brett Favre” and un-retire. He gave the game of baseball, and the New York Yankees specifically, everything he had. Joe Namath once said, “If you aren’t going all the way, why go at all?” Pettitte, a workhorse, and a perfectionist on the mound, must have asked himself this very question. Most likely, the answer wasn’t up to his standard of excellence and he decided to move on rather than perform at a level below what he expects. Pettitte’s Reliability Will Be Tough To Replace. So Andy Pettitte will call it a career. One of the most beloved and reliable players in Yankees history, he will retire a 3-Time All-Star and a 5-Time World Series Champion. He is the all-time leader in Postseason victories (19), finishes with a 240-138 career regular season mark, and a 3.88 ERA. Along with teammates Derek Jeter, Jorge Posada, and Mariano Rivera, Pettitte helped make up the “Core 4” of longest-tenured Yankees, despite playing three seasons in the middle of his career for the Houston Astros. Perhaps his most memorable moment in pinstripes came during his second season in baseball. It was Game 5 of the 1996 World Series, and the Yankees and Braves were tied at 2 games each. The Yankees called on their young lefty to win a pivotal game in Atlanta, squaring off with John Smoltz. Pettitte threw 8.1 innings allowing 0 runs on just 5 hits. That night, his reputation as a big-game pitcher would be born. Over the next 14 years, Pettitte would appear in 7 more World Series (once with Houston in 2005) and would consistently answer the bell when called upon. Whenever the Yankees were in need of a big win after a Game 1 series loss, Pettitte could be trusted with the ball. In 2007, Andy Pettitte confronted the allegations of his HGH use with the same class he displayed throughout his tenure in the big leagues. His admission to wrongdoing restored faith among fans and his sincerity allowed him to turn a dark page that other offenders never could. With his retirement, Pettitte will most likely settle back down in Texas, with his family, and leave behind a legion of adoring fans and a suspect pitching rotation in the Bronx. 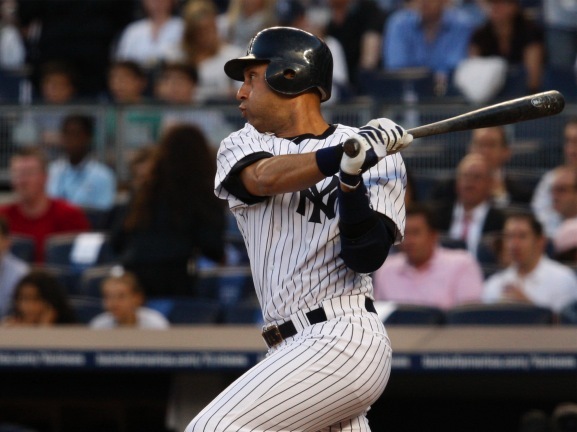 The 38-year-old Yankees legend will depart as an iconic figure in franchise history and a fan-favorite. Tomorrow, when Andy Pettitte tells the world he’s retiring, trust him. He will not be making any comebacks, not if he doesn’t believe he can pitch at the level he expects. While his final statistics place him in the Hall of Fame discussion, there is no guarantee he will ever find himself enshrined in Cooperstown. 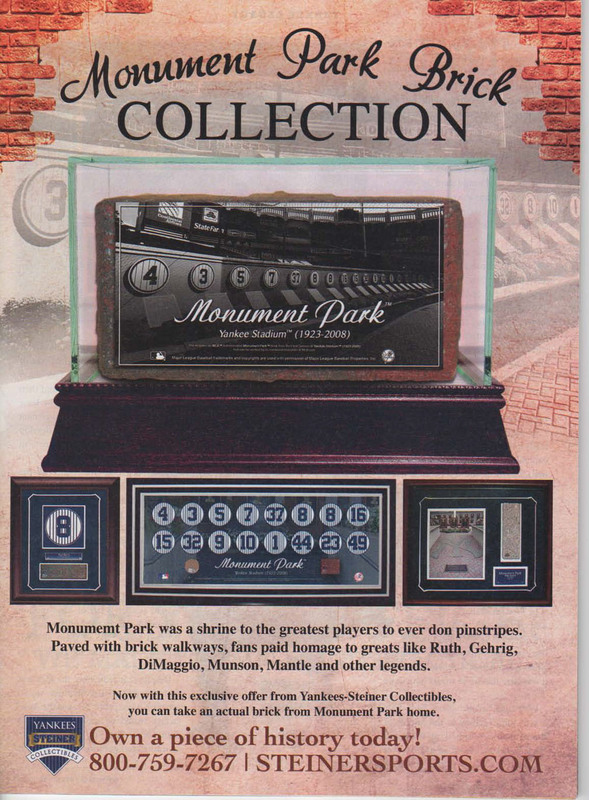 Monument Park is a different story. Andy Pettitte Day at Yankee Stadium will happen one day soon and his #46 will be removed from pinstriped circulation. He’ll be honored for his remarkable body of work, his class, and for the way he represented the Yankees. The game of baseball says goodbye to one of its greats. Yankees fans will miss him and his reliability on the mound will be nearly impossible to replace. Metallica’s “Enter Sandman” might not be playing, but everyone will know when Mariano Rivera enters the room. On Monday, February 7, the greatest closer in the history of baseball will be meeting and greeting fans at the Steiner Sports Corporate Headquarters in New Rochelle, NY. Rivera commands a room just as well as his cut fastball, and will have the lucky audience captivated with his pinstriped stories. 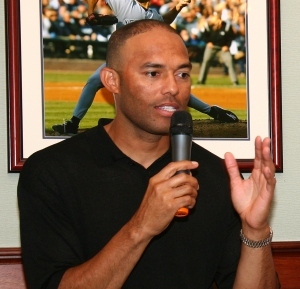 Want to Meet Mariano Rivera? A 5-Time World Series Champion and 10-Time All-Star, Rivera’s legendary career with the Yankees is mind-blowing. At age 41, he has shown no signs of slowing down, and has remained at the top of his craft for over 15 years. He is currently just 42 saves behind Trevor Hoffman on the all-time saves list, a number he could potentially pass in 2011. During the hour-long event, Rivera plans to recount his past successes and entertain questions from fans. After posing for photos with those in attendance, fans will receive a special limited edition photograph, signed and inscribed specifically for the event. Restricted to just one hundred total people, this unique opportunity to spend time with the future Hall of Famer is not to be missed. Among the most intimidating pitchers of all-time, Rivera is warm and respectful in person, reinforcing his place in the hearts of Yankees fans. Raucous crowds welcome him nightly in the Bronx. When the Sandman enters the room on February 7, he will have the audience silent, in awe, hanging on his every word. “The Boss” did it again, one last time. As the baseball world prepares for tonight’s 81st All-Star Game in Anaheim, George M. Steinbrenner III grabbed the headlines for the final time. He passed away, early this morning, at his Tampa home. He had just turned 80 years-old on the fourth of July. Bob Sheppard, the legendary Yankees Public Address Announcer, died this past Sunday. “The Voice of God” never wanted to be the story, he just wanted to introduce it before it happened. By contrast, Steinbrenner relished the spotlight. He was bombastic, relentless, and focused. He took great pleasure in owning the back pages. After all, he often had the best product, in the biggest city, and wanted everyone to know it. Reporters would wait for him and hang on his every word. A colorful quote from George Steinbrenner was priceless, and he knew just what people wanted to hear. His 37-year reign atop the Yankees organization saw his club win 11 American League Championships and 7 World Series, including the final one played during his remarkable life, this past season. In 1973, he headed a group of investors who purchased the franchise for just $10 million. He proceeded to build the team into a billion dollar operation over the next four decades. It wasn’t always champagne and championship rings along the way for Steinbrenner. His fickle personality created tremendous tension around his employees, including his managers who always seemed to be on notice. 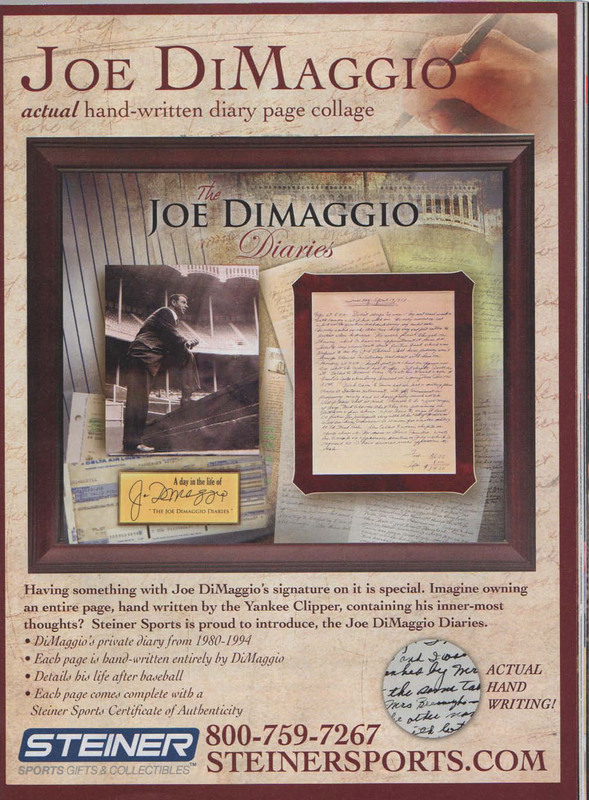 He changed managers 20 times in his first 23 years as owner, including five separate stints for Billy Martin. He also fired Yogi Berra just three weeks into the 1985 season, creating animosity that kept Berra away from the Bronx for 14 years. 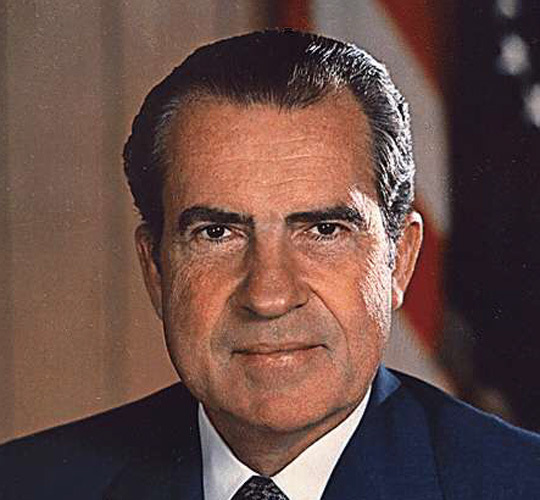 He was suspended from baseball twice, once in 1974 for his involvement in a President Nixon campaign finance scandal, and again in 1990 when he paid a man named Howard Spira for “dirt” on his own player, Dave Winfield. 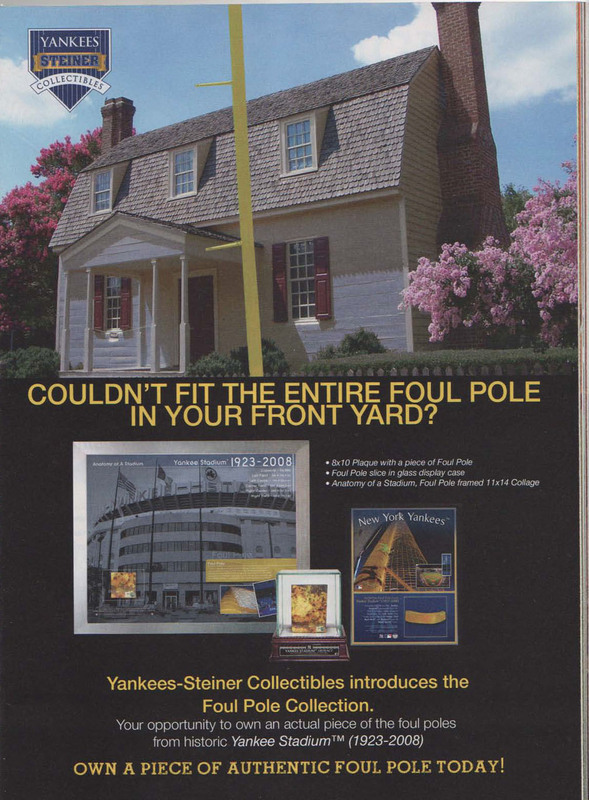 Upon his return to baseball in the mid-nineties, a calmer Steinbrenner helped stabilize the franchise. He hired Joe Torre as manager, developed young, home-grown stars in Derek Jeter, Mariano Rivera, Jorge Posada and Andy Pettitte, and won 4 World Series titles in 5 years from 1996-2000. “The Boss” had tremendous financial resources that teams in other markets didn’t enjoy, but he routinely pumped that money back into his team. 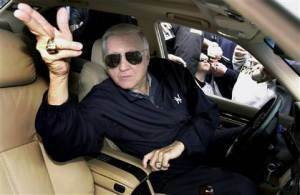 Many chastised Steinbrenner for his free spending, but ultimately, he operated within the rules of the sport and raised the competitive bar throughout baseball. As his health declined in recent years, and the power shifted to his sons, Hal and Hank, the winning mantra remained strong. Steinbrenner demanded perfection from his players, and considered anything short of a championship to be failure. 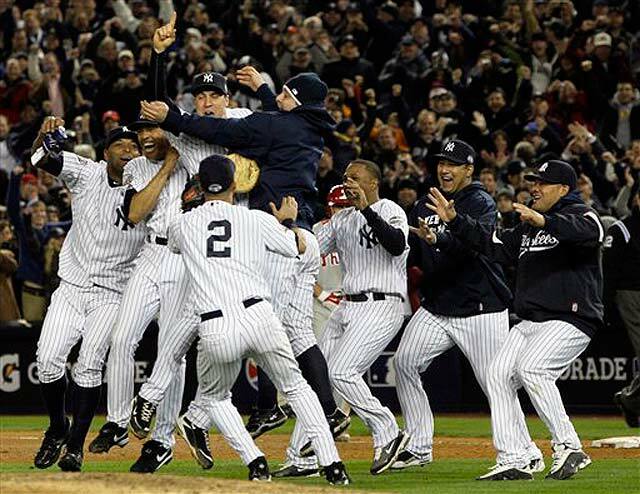 In 2009, for the final time on Steinbrenner’s watch, the Yankees captured the 27th World Series in franchise history. It was one last Title for a man who devoted all his energy to winning. He went out a winner.